Earlier today, Jeff Sullivan examined the most changed hitters — change for better and for worse — in the game. In this post, I want to revisit one of the hitters most famously averse to change — for better and for worse — in Eric Hosmer. From speculating on what sort of contract he might receive to analyzing the contract he actually did receive to evaluating his swing mechanics, this author and others at FanGraphs considered Hosmer at some length during the offseason. He was one of the key figures of public interest in what seemed like the longest winter ever. It only seems appropriate that we revisit Hosmer this spring — particularly after I approached him in Arizona during exhibition season and asked him about whether he was thinking about making changes. That conversation didn’t start well. “What are you trying to ask me? About launch angle?” exclaimed Hosmer as I (indeed) attempted to use that precise term, which can have a negative connotation in clubhouses. The conversation proceeded rather amicably, though, and Hosmer even disclosed he had spent some time exploring the “Air Ball Revolution” and how he could possibly benefit from coming aboard. Hosmer said he watched “a lot” of Craig Wallenbrock’s videos, the same Craig Wallenbrock who had famously worked with J.D. Martinez to help him transform from fringe major leaguer to a fearsome slugger. (Martinez, like Hosmer, is a Scott Boras client.) Hosmer said on several occasions during the offseason that he hit with Martinez’s current outside hitting coach Robert Van Scoyoc, who has since been hired by the Diamondbacks. “There were a of couple times where I worked with [Martinez] and Robert, his guy,” Hosmer said this spring. “J. Wash [Padres assistant hitting coach Johnny Washington] is a guy here who preaches the same thing. Would Hosmer begin to tap more into his power? Would he begin to start converting some of his ground balls into air balls, as so many outside voices have suggested he ought to do? For the first time, he seems to be thinking about it. But to date this season, Hosmer doesn’t seem to have changed at all. His 2.5 GB/FB mark is exactly the same as last season. Hosmer has hit two ground balls for every fly ball in every season since 2015. He has 2:1 ratio for his career. Hosmer has actually lowered his average launch angle from 3.8 degrees to 2.4 degrees this season, a figure which ranks 11th lowest among the 373 batters to have put at least 25 pitches in play. His pull rate of 36.2% is in line with his career mark of 34.7%. He’s swinging at 30.3% pitches out of the zone after swinging at 30% of such offerings last season. His swing rate remains in line with his normal rate. And after posting HR/FB ratios of 21.4% and 22.5% the past two seasons, the best two marks of his career, he has a 25.0% rate early this season. In many measurable ways, Hosmer remains one of the least changed hitters in the game. The same-as-ever Hosmer is just fine, really, slashing .271/.377/.488 with a 140 wRC+. Curiously, though, his walk and strikeout rates have spiked. One reason is pitchers have approached him differently in the NL. The amount of pitches that have been thrown within the actual confines of the strike zone to Hosmer has dipped from 43.5% last season to 38.6% this season. The lowest zone mark of Hosmer’s career was 40.8% in 2016. 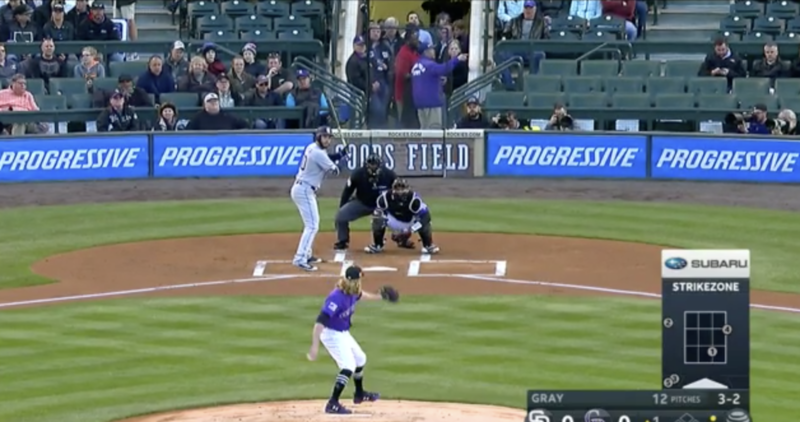 He is seeing pitches in the strike zone at the 10th-lowest rate in the majors. Names like Joey Gallo, Bryce Harper, and Giancarlo Stanton are above him on the list. Pitchers new to Hosmer seem to be approaching him carefully or seeing if he’ll expand his zone. The pitch types, specifically, haven’t changed — 52% of the pitches he saw last year were fastballs, the same as this season — but Hosmer has worked into deeper counts more often and his zone contact rate is down from 90.0% last season to 84.5% this season. That’s another change. And then there’s this: since April 27th, he’s had a 1.1 GB/FB ratio. He’s crushed the ball over the past two weeks, posting a .432 wOBA and a 182 wRC+. His average launch angle has been 10.5 degrees during that period. 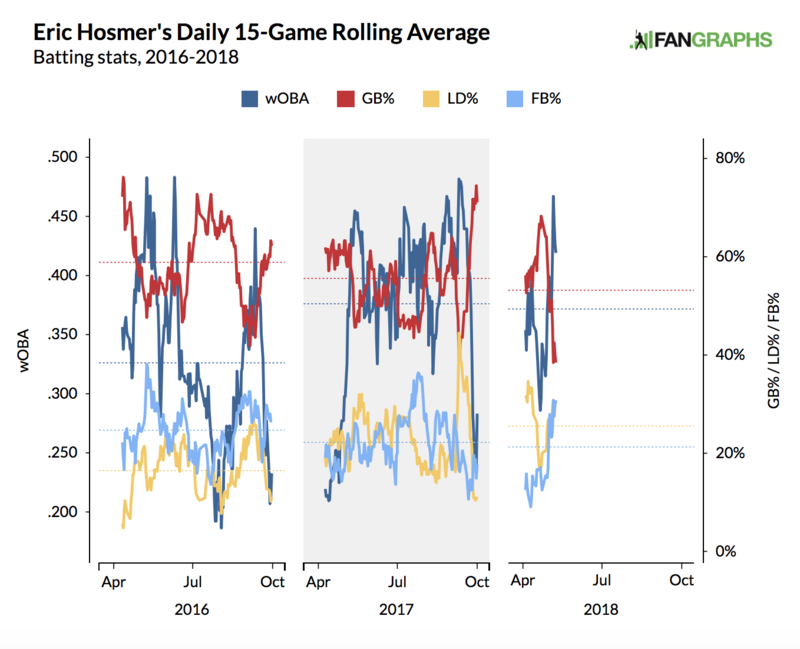 Hosmer, like every hitter, has fluctuations in batted-ball quality, but because he seemed curious in exploring change this offseason, perhaps any uptick in air balls should grasp our attention. To date this season, Hosmer is not a different hitter. He’s been a productive player, and pitchers have approached him differently, but perhaps there are some other changes to his swing and profile that will be discovered with more comfort, reps, and time. Hosmer doesn’t have to change to be a productive major-league hitter, and he hasn’t changed to date. But it would still be interesting if he did. 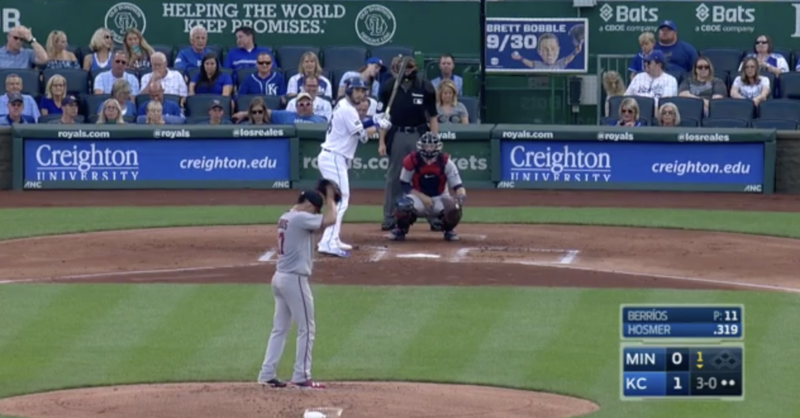 We hoped you liked reading Your Periodic Eric Hosmer Swing Update by Travis Sawchik! Over the last calendar year in 822 PA he has a 136 wRC+. That’s 18th in the league during that period. How many times can you be wrong in the same way in a single thread? Agrumenting is the worst. Even worse than those squiggly red lines unerd som of my words. Neither is ‘Eric Hosmer is bad’, Baron Samhypocrite.